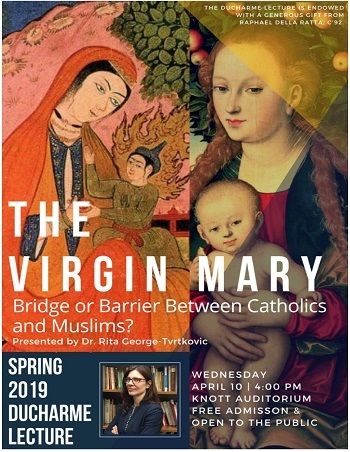 Rita George-Tvrtković, Ph.D., a specialist in historical theology, medieval Muslim-Christian relations, and Catholic theory and praxis of interreligious dialogue, will present the Spring 2019 Ducharme Lecture titled, “The Virgin Mary: Bridge or Barrier between Catholics and Muslims.” The lecture will be held Wednesday April 10 at 4 p.m. in Knott Auditorium. An associate professor of theology at Benedictine University in Illinois, George-Tvrtković is the author of the book Christians, Muslims, and Mary: A History. 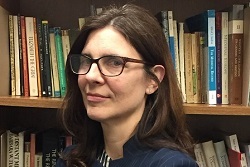 She has been published in numerous peer-reviewed academic journals including The Catholic Historical Review, Medieval Encounters and Theological Studies. George-Tvrtković’s lecture will begin her lecture by comparing Biblical and Qur'anic Annunciation stories, and then sketch out the contours of a broad historical trajectory which has vacillated between opposite ideas: Mary as interfaith bridge or Mary as interfaith barrier. The lecture will also examine pivotal texts, art works, and shrines which have brought Christians, Muslims, and Mary together, and which have affected Catholic views of Islam in both positive and negative directions, depending on time and place. The lecture will conclude by discussing what a key Vatican II document, Nostra Aetate, has to say about Muslims and Mary. Does this long history of sharing Mary continue to affect Christian-Muslim relations today? Held twice a year, the Ducharme Lectures are an ongoing series that fosters the integration of learning between different fields in the Mount’s core curriculum. The lectures are named in honor of Professor Emeritus Robert Ducharme, Ph.D., who advanced the Mount’s mission for 39 years as an English professor and department chair. The Ducharme Lectures are endowed with a generous gift by Raphael Della Ratta, C’92, who was an English and philosophy major at the Mount.